LA PLACE, SIMON-GÉRARD DE (baptized Jean, sometimes referred to incorrectly as Simon Girard de La Place), priest, Recollet, missionary; baptized 19 Aug. 1657 at Rouen, son of Pierre de La Place and Marie Le Couteux; d. 1 Jan. 1699 in Acadia. 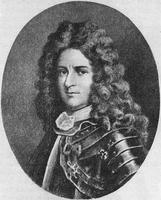 Simon-Gérard de La Place joined the Recollets of the province of Aquitaine in 1673. He was appointed a missionary to New France and landed at Quebec in the summer of 1683. He stayed there until the spring of 1685, when he was put in charge of the post on the Saint John River. He took up his abode at Medoctec (now Meductic), the principal Malecite village, and there he received on 18 May 1686 a visit from Bishop Saint-Vallier [La Croix*], who esteemed him very highly. For ten years he laboured to teach the Indians the truths of the faith with a zeal that earned him the praise of the bishop of Quebec as well as that of Joseph Robinau de Villebon, governor of Acadia. In the autumn of 1695 he went up to Quebec to present the intendant, Bochart* de Champigny, with the census that he had taken of the Indians of the Saint John River. Back in Acadia in the spring of 1696, Father Simon accompanied as chaplain some 150 Indians who were taking part in Pierre Le Moyne* d’Iberville’s expedition against Pemaquid. On 26 August he came back to Fort Naxouat (Nashwaak), the seat of the governor of Acadia, to announce the victory of the French and the capture of Pemaquid by the Malecites. During the winter of 1696–97, as Fort Naxouat was without a chaplain, he took it upon himself to provide religious services on Sundays and feast days. His strength soon gave way under the ardour of his zeal, and on 1 Jan. 1699 he died in odour of sanctity. 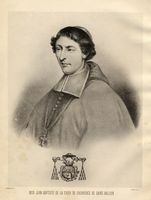 His brother, Father Louis-Hyacinthe de La Place*, tells us in a letter to his mother that on the orders of the governor of Canada the body of Father Simon was taken to Quebec to be buried in the Recollet church there. Frédéric Gingras, “LA PLACE, SIMON-GÉRARD DE,” in Dictionary of Canadian Biography, vol. 1, University of Toronto/Université Laval, 2003–, accessed April 24, 2019, http://www.biographi.ca/en/bio/la_place_simon_gerard_de_1E.html.